Read more about Come Celebrate Earth Day With Us! We hope everyone is having a great day. Next Thursday, April 25th, the leasing office will be closing at 3:30pm. Please ensure that you stop by before this time if you need to retrieve any packages from the office. We apologize in advance for any inconvenience this may cause. Please do not hesitate to contact us with any concerns you might have. Find An Escape From Your Long Week! As a resident at Amalfi Apartment Homes show this flyer and receive 15% off your booking at The Escape Game. Read more about Find An Escape From Your Long Week! Our new parking permit program will start on April 15 th , 2019 and some residents have not registered their vehicles. If you do not have a decal by the evening of April 15th, the car will be towed off property at your expense. Each adult resident on the lease will be provided 1 parking decal for their vehicle. In order to receive the decal, you must show a valid photo ID to the office along with the vehicle’s registration form . Please note that the vehicle must be under your name in order for you to receive a decal. It was a pleasure to speak with you today. If you have any further questions please feel free to connect with me. Have an amazing day! Thank you very much for speaking with me this morning. If you have any further questions please feel free to connect with me again. Have a great day! Our new parking permit program will start on April 15 th , 2019 and some residents have not registered their vehicles. Espero que este bien. Gracias por hablar conmigo ayer. Si necesita algo mas, dejeme saber. Refer your friends and family and receive $50 rent credit when they move in! 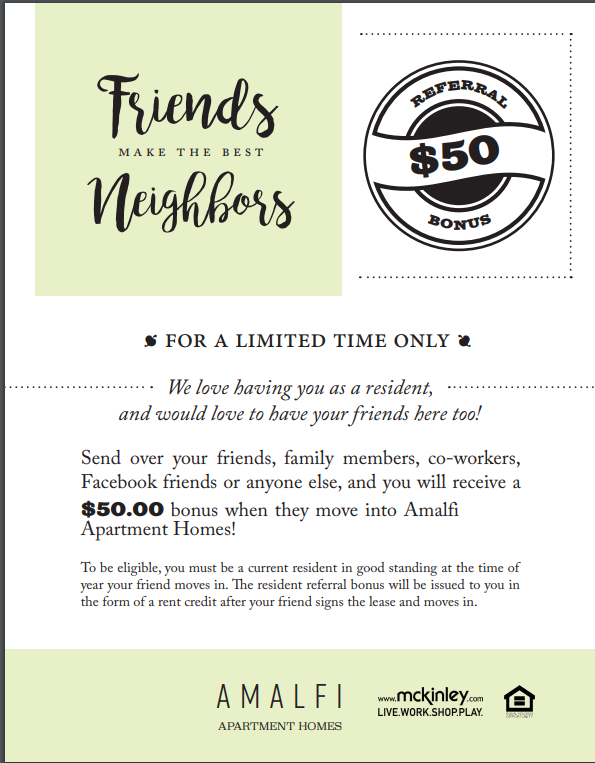 Read more about Refer your friends and family and receive $50 rent credit when they move in! We hope everyone is doing well. We have to replace a breaker in building 4864 and this may cause a shortage in all the apartment homes in this building. We apologize for this inconvenience but the shortage will be between 10:45am and 11:15am today. If you have any questions, please contact us at 407-843-4663.